I’ve just sent my work into the world. On Saturday night, I opened my first solo art show entitled If the Ground Moves: Villanelles in Mixed Media. In the morning, we filled the room with poetry and paintings, installing my work into the space. In the evening, the room filled and flowed until no seats were left and friends had to stand. There was conversation. There was music. There were my paintings looking out at everyone, singing their own song. And then there was me at the microphone, reading precious words to those who had gathered. For right now, after so many words and brushstrokes – it seems I can’t say much. I am ridiculously happy with how it’s all come together, but I cannot pull a clear thought together about how I feel, where I stand, or what in the world is going on in my head. In the meantime, my poetry and my paintings will hopefully keep talking for me. They are still up at Scarsdale on Shaw Boulevard until February 1st. If you were one of the friends present at the show, talk to me. But seriously, call me, send me a message, drop me a line at nathania.aritao@gmail.com or visit my new page here. Give me violent reactions. Send me drawings. Make up diagrams. Talk back! I swing back and forth. Mostly I am tickled with delight or excitedly nervous, but between this and that thought, I freeze momentarily in terror. 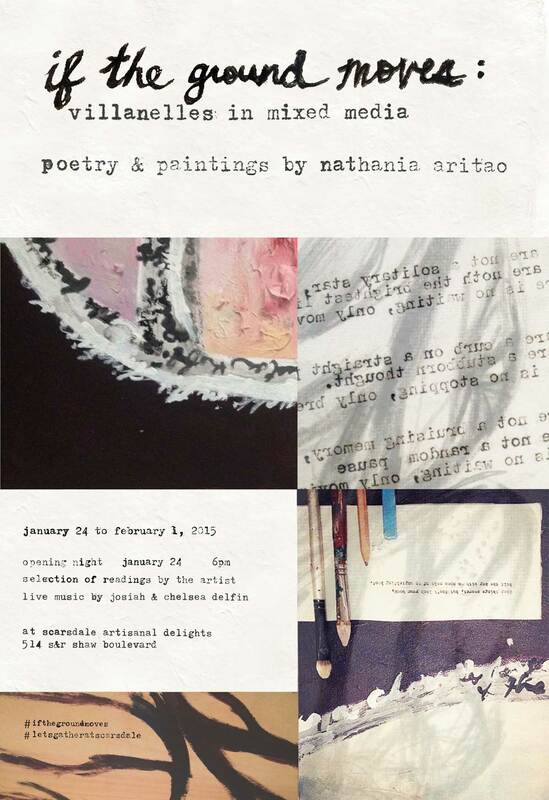 I am putting up my first solo show of poetry and paintings. This is a dream come true. And hopefully the first show of a lifetime of sharing art. It is also an exercise in vulnerability. My paintings and drawings will be on the walls, as will my words, carefully pieced together. On the opening night, I will pick up a mic and read to whoever has gathered. Last year I vowed I would make more time for my art – between the adventures of running operations for a social business, teaching classes at the barre and telling stories to Filipino children affected by the destructive typhoons. While traveling in September, after a caffeinated wave of inspiration, I decided I would go for it. This is me going for it. Friends tell me I am brave for doing this. And though that strengthens my heart, it is also when I hear those words that I remember to be scared. Walk with me through my 2014. Thank you for all your ridiculousness, your storms, your breakthroughs. One last look, but actually, 2014, I’m quite over you. I traveled to see people. 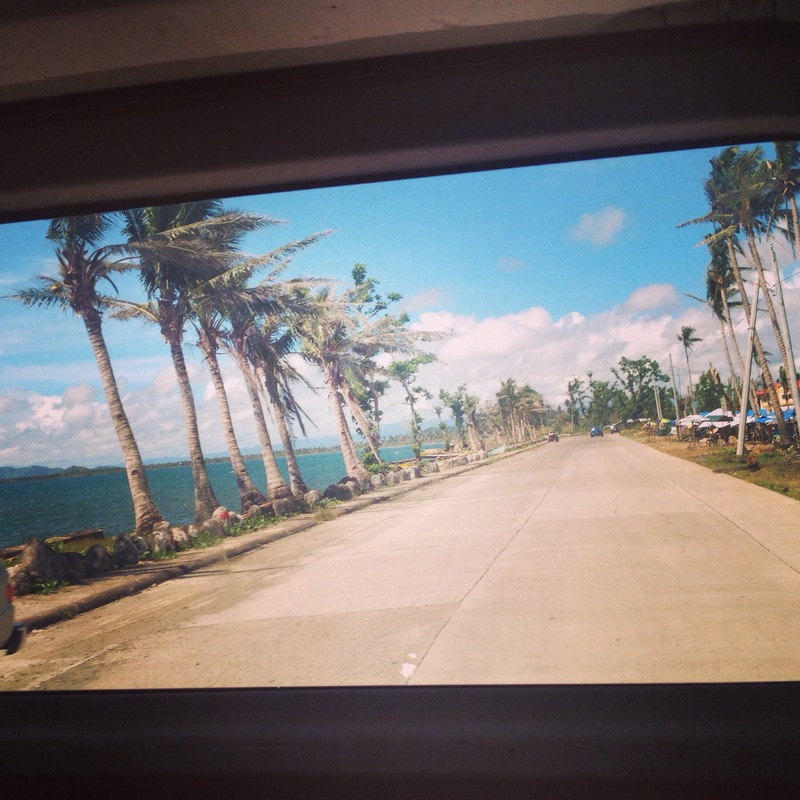 I traveled with Buhay Makulay. I traveled alone. I stood in front of thousands of little children, from the poorest communities I know, trying my best to shape life into the word hope by telling stories and painting murals. I was welcomed into the makeshift houses of families that lost theirs. I saw the impact of history’s strongest storm and the brokenness, amidst powerful healing, that persisted months after. I was reminded of God’s faithfulness. I was left in awe of people living with less wanting. People living with less. I met heartbreak. The dream shattering, paradigm shifting, inky, moonless kind of heartbreak. I paid a lot of bills. I sold back my first car to my brother after an expensive year of maintaining it, and bought a smaller, more fuel-efficient new one in the same color. I still didn’t gather enough courage to drive. I went on adventures. I wandered. I met healing. The joy mending, light pouring into your dusky musty cave, dewy, liberating kind of healing. I picked up my pen again and wrote poetry. I moved out of my family’s house and got my own place. I received visitors. Friends with noise and laughter. I learned how to teach four more classes at PlanaForma. I tried hard to make time for my sketchbook and blank canvases. I made a lot of challenging decisions as a manager running operations at The Paper Project. I listened to my gut. I stood in front of the work of some of my favorite artists like Sebastiao Salgado and Mark Rothko. I got to spend time with friends who live far away. I cried more this year (almost certainly) than my whole lifetime of crying after the age of five. I met hope, again and again. I made a lot of messy, but valuable mistakes. I was embraced by community. The spirit resuscitating kind of community. I started to skip the trips to the salon. I cut my own hair. I danced. But not enough. I prayed. But also not enough. I ate a lot of good food. A lot. I laughed. Hopefully more than I ate good food, or at least just as much. I claimed big visions for the new year. You were one for the books, 2014. Now, please pleasantly get out of my way.